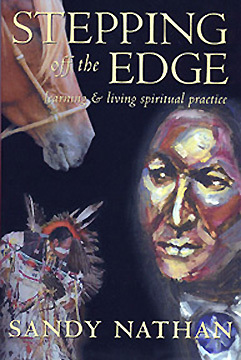 The Gathering retreat inspired Sandy Nathan's award winning book, Stepping Off the Edge. Stepping has extreme relevance for this article. Okay––here’s the situation. We’ve all experienced something like it: You haven’t spoken to Shelly recently. Actually, your “speaking” is done by email these days––you live on opposite ends of the continent. But you were very good friends years ago and have gotten close again through emails. You feel like you’re sisters . . . Her emails have slowed down in the last six months; you figure she’s busy. Or something. 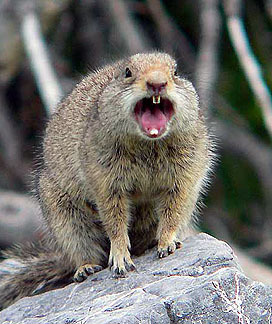 And then you get an email from her about something you wrote six months ago. You were feeling scared about something, and told her all about it. It didn’t seem like a big deal, and you were sisters, after all. Your words have festered in her brain for six months. She’s been silently building a case against you. And not about your behavior––about you. She’d used your not-well-thought-out words as evidence proving you’re pond scum. All these months, she’s been judging your personal worth and frying you in a metaphysical trial that you knew nothing about. You write back, explaining what you meant, the circumstances, how you’re irrationally fearful about somethings and why. You say you’re sorry, if this happens again, tell you sooner so you can work on it. What comes back is a “well, so what”––and a stronger, more black and white indictment of your character. You’re bad. You’re wrong, you’re no good in a very fundamental way. She doesn’t respect you or what you did/are. You write back, defending yourself, your temper up this time. And then she demands all the gifts she’s given you over the years back, things that meant a lot to both of you once. So you say to yourself, “Do I want a friend like this? Is this a friend?” And terminate the relationship. Or, you give in and say, “Shelly, you’re right. I did a bad thing. I am a bad person.” And then try to negotiate a relationship and peace with this difficult person . . . until you finally realize it can’t be done. I SAY: HOOEY! BALONEY! The above may be true for a meditation master at the height of his or her powers. But a civilian? Yeah, right. I’ve done more psychological/spiritual/metaphysical work on myself than almost anybody I know. A betrayal hurts. What you can do about the pain is limit how much and how long you hurt. 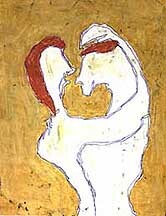 Communion, by Lily Nathan. Isn't it nice when life is like this? But, having a transcript can change things. You may find that you got as nasty as Shelly did, and just as fast. Maybe it wasn’t all her fault. Or, you may see how much you tried to make things right, how you apologized and explained. And how it didn’t matter to her. In that case, Do you want Shelly as a friend? The facts should help soothe the pain. 3. REVIEW THE HISTORY OF YOUR RELATIONSHIP AND SHELLY’S LIFE AS YOU KNOW IT. You were buddies years ago. Why did that end? Did she do some arbitrary and judgmental thing before? Hurt you? Betray you? Write it down. (You’ll need a journal to get the most from my blog, readers.) Why did the friendship end before? How is that similar to now? And how’s Shelly doing in her life? She’s told you in her emails; really look at it what she’s said, outside the forgiving glaze of friendship. Has her life been a succession of failed marriages, relationships that don’t last, unfinished goals, and job problems? Does she describe her bosses and the people who run her company as jerks? Did she just get demoted, or fired, but it wasn’t her fault? If this has been going since you knew each other years ago, your ears should prick up. Notice these patterns. When a run of bad luck goes on for most of a lifetime, it’s a problem that needs attention. Is Shelly like that? If our lives are long term disasters and or most of our friend’s lives are the same, we need to look at that, too. Along with our own life histories. The Secret is a popular book & and DVD talking about the Law of Attraction. Which basically means, you attract that which is like you. Or: Your life is your mind on a big screen. Simplistic, but true. Everything in our lives reflects our state of mind/psyche. Upgrade your state of mind, and you’ll upgrade your experience. One way to do that is eliminate the negative. Sayonara, Shelly-baby. 4. STILL HURTS, DOESN’T IT? Because you didn’t see it coming and thought you were friends. You wish it didn’t happen. Review steps 1. to 3. above. Do you want this person for a friend? You can go back and plead for mercy. 5. WHAT CAN YOU DO TO FILL THE HOLE IN YOUR LIFE POST-SHELLY? Do you have other friends who can give you what Shelly did without the possible betrayal? Spend time with them. And what did you write about in your emails with Shelly, anyway? Gossip? Talk about your spouse, boss, family? What’s wrong with the world? If you don’t change the parts of your mind that attracted a person like Shelly, you will quickly fill the Shelly-void with other Shellys. They may look different, but their effect on you will be the same. Get busy. Start a hobby you’ve always wanted to try. Exercise. Join a gym. If you’re online too much, try the REAL WORLD! It’s so exciting. Work on your life goals. Don’t have any? 6. FIND YOUR LIFE’S PURPOSE AND FIGURE OUT HOW TO ACHIEVE IT. THEN DO IT, STEP BY STEP. My book, Stepping Off the Edge, acts like a depth charge in getting your inner MOJO going so you discover your life’s purpose and start working toward it. It blasts through the crust of cynicism, laziness and fear that coats daily life. When you’re living your life’s purpose, whatever the Shellys of the world do to you will hurt less. Guaranteed. 7. GO TO A THERAPIST OR PROFESSIONAL HEALER. The Shelly situation is still going to hurt, even if you do all this. Sorry, but I hope you’re down to the little dregs of pain at the bottom of the carafe by now. If you’re not, and you’re still hurting like crazy after going through all these steps, this may point to a deep seated pattern or abuse in the past. Go to a licensed psychotherapist with your pain. I’m big on professional help. If the Universe intended us to handle all our problems alone, the Universe would have created just one person. There’s lots of us humans–-we need to rely on each other. And here’s a true story about telling your problems to friends: Back in the 1980s, my husband and I were best friends with another couple. They were so fun and lively, and they had little kids the ages of ours. 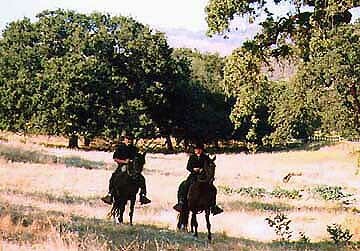 Our two families did something together almost every weekend; we spent holidays and birthdays together. We talked about everything; after all, we lived in the San Francisco Bay Area, birthplace of est and the human potential movement. Talking about feelings was good, telling the truth was wonderful. Okay, life being as it is, problems arose. Our business was going belly up, slowly, then fast, then slowly again as we slaved to resuscitate it. Our business could have been an episode on ER, if dramas carried out in financial data were fun. And there were other problems on our side. We were really down, my husband and I. Of course, we told our dear friends about it; they loved us, yes? We saw them all the time. Except that stopped abruptly: They dumped us. Didn’t call, didn’t return our calls. We had no idea why. No explanation, no recourse. You think that hurt? Only twenty five years later did I have the enormous insight that maybe we weren’t fun any more, in our truth-telling. Maybe the other couple would rather spend their time off with people who were enjoying life and didn’t remind them of how grim it can be. We’ll never know––that friendship is kaput. Gone. There was no post-game feedback session. But the episode left me with a healthy respect for the limits of friendship. Some relationships are built on unspoken rules: We hang out together as long as we’re having fun. We don’t care about your troubles. The other thing about telling your problems to your friends is they aren’t trained psychotherapists. I learned a lot getting my MA in Marriage, Family, & Child Counseling. I learned a lot in the supervised hours of counseling I did in pursuit of my license. And I ended up having two kids instead of getting licensed to practice––but I learned how important all those hours of supervision the state requires for a license are. Your friends can’t do what a therapist can; they’re not skilled enough. And the nature of friendship precludes saying some of the stuff your therapist may need to say to you, and you to her/him. So, if you’ve tried all the self-help routes to get over the pain of betrayal, take your anguish to a professional therapist and work on it. You’ve got to go to a good therapist. You’ll get better with a good therapist. With a bad one, you may get better––or worse. Or stay the same. You want to get better, yes? A good therapist has a productive balance of empathy––”Oh, poor baby . . . “––and truth telling––”So that was the seventh time you’ve gotten in a relationship with someone who treated you like slime. Can you see a pattern? What’s in it for you that you keep doing this?” Not much fun, but better than ending up married to Shelly. Your dog will always love you. Your dog will NEVER leave you. Or send mean emails. 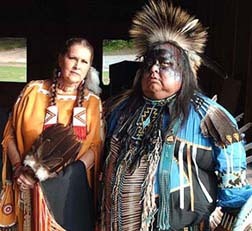 Emerson and Linda at the Gathering's Pow-wow. You can always find more interesting friends! These are great friends of mine. Jenny and Emerson are at the Gathering in Tennessee. This is the Native American spiritual retreat that inspired my book Stepping Off the Edge, winner of six national awards so far. See, go to the Gathering. You’ll forget about Shelly! Maybe you’ll write a book . 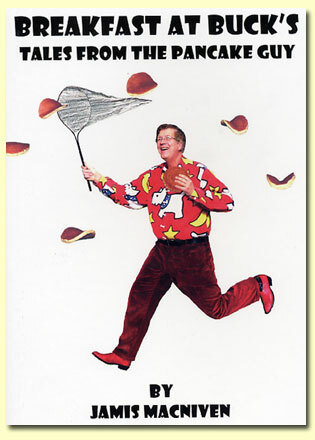 . .
Read funny books, and see funny movies! This is my friend, Jamis MacNiven’s book, Breakfast at Buck’s. Buck’s Restaurant is the zanny, whacko, and very good restaurant in the heart of Woodside, CA, which is the wooded, upscale, residential heart of Silicon Valley. If you’ve been to Buck’s for breakfast, you will know how the book got its title. The CEOs and big-wigs of the hi-tech companies eat oatmeal there between 7 and 9 AM. Deals go down. You could fry eggs on the intellectual/emotional intensity. It’s a trip. So, go to Woodside and Buck’s Restaurant and have a good time. Or read Jamis’ book. You can also watch his son TYLER’S movie about walking the length of Japan in an attempt to find his father’s birthplace. Tyler had a small sketch of rock formations made by his grandmother while she was there (with his grandfather) as a missionary in the 1940s. Notice that this hysterically funny, warm and very interesting movie comes to you on the same computer that carried Shelly’s horrific messages. And go to Scott Kalechstein Grace’s website. He’s so funny, you’ll fall over laughing. If you get on his mailing list, he’ll send you songs he wrote just for YOU! Where you look is what you see. 11. FINALLY, DON’T WORRY ABOUT ANYTHING! 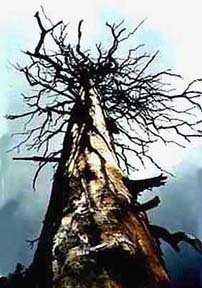 This Lightning-blasted Tree Reminds Me of God's Power. It's even better when you see the picture full sized! Or the tree! Even the big stuff is small stuff, eventually. Don’t worry about Shelly. She’s already being handled. Sandy Nathan, award winning author. I'm 46 years old here. No nips, no tucks, no fancy lenses. I write about shelf life. 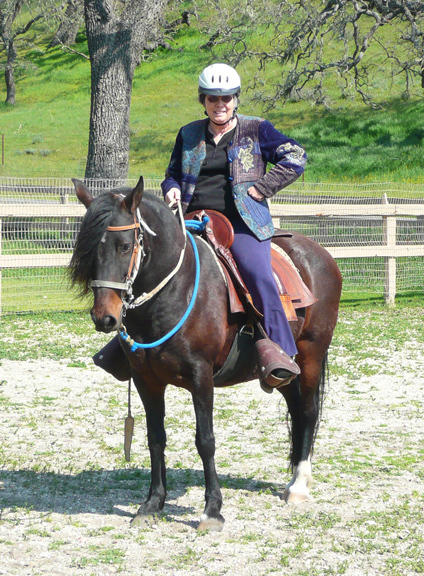 Sandy Nathan, multi-award winning author of The Angel & the Brown-eyed Boy, Tecolote: The Little Horse That Could, Stepping Off the Edge: Learning & Living Spiritual Practice (This blog article is sort of like a sample of Stepping Off the Edge.) and Numenon. Sandy holds Master’s degrees in Marriage, Family & Child Counseling and Economics. 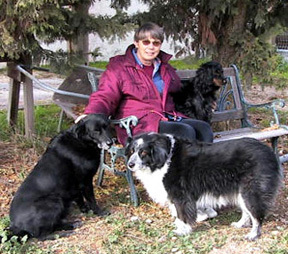 Her books have won twelve national awards, in fields from self help to spirituality and religious fiction.